Finally motorcycle luggage that doesn’t look like it belongs on an ADV Touring Bike. Burly Brand’s new Voyager luggage series is geared more to the new younger generation of Harley Davidson, and custom motorcycle riders. The Voyager Luggage is all made from wet-waxed, UV treated canvas cotton that has a vintage worn styling. The Tank/ Tail bag is made for a Sportster tank and magnetically pairs with it perfectly. This convenient bag also features a magnetic removable map/accessory screen that can sit on top of the lid of the bag or stick right to the tank. 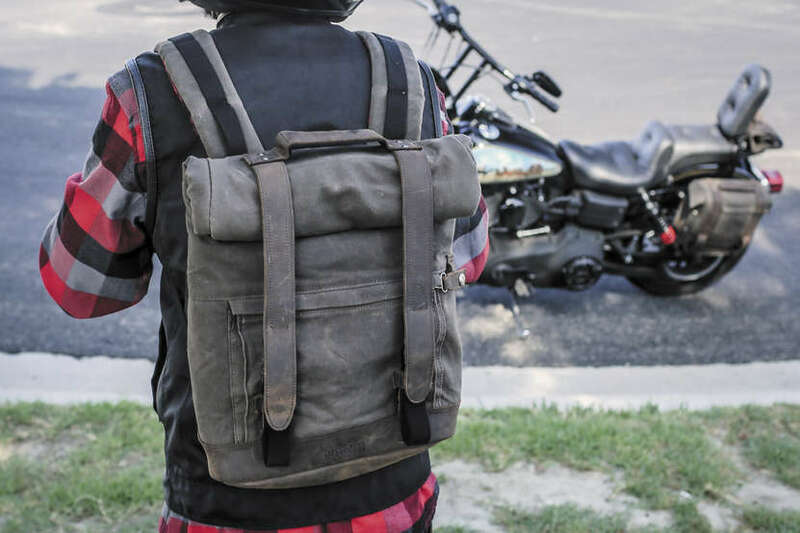 The Burly Brand Tank/ Tail motorcycle bag will create space for you to take some essentials with you on your bike. The Roll Top Backpack has plenty of storage and an Anti-Flail Snap System to make sure nothing falls out when riding on the bike. This backpack has flannel detailing on the straps of the bag and leather exterior panels for support. The Burly Tool Roll will keep you prepared for whatever happens on the road. There are two leather securing straps and a leather handle to offer support and mounting points. This tool roll features an eight-pocket system in three widths to accommodate multiple tool sizes and a catch-all zipper pocket. It can be strapped to your handlebars, sissy bar, or the side of your frame.